LAMP stands for Linux, Apache, MySQL and PHP. This script installs those programs and packages at once easily in Ubuntu. Press Ctrl + Alt + T on your keyboard to open the terminal. When it opens run the commands below to install the packages. During the installation, you’ll be prompted to create a password or MySQL server. Create one to continue. 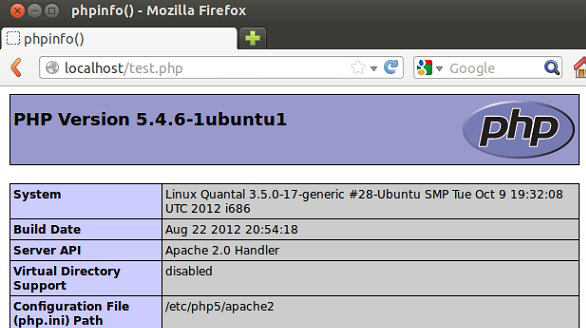 After the installation, test Apache by opening your web browser and typing localhost. When you seen the screen below, it means Apache is functioning. To test PHP, create a test page by running the commands below. Then copy this line into the file and save it. Thanks for ones marvelous posting! I genuinely enjoyed reading it, you might be a great author.I will make sure to bookmark your blog and may come back at some point. I want to encourage yourself to continue your great posts, have a nice weekend!